March is over, and it was incredibly busy but rewarding. Work on Human Resources has continued at pace, with an important milestone being achieved. I’ve been working with my developmental editor to turn the draft manuscript into something that will truly shine. It’s been hard work, but during the last month we reached an important milestone — we finished work on the change plan (completed the new outline) and I have now started the rewrite. I wrote a blog about the developmental edit process and reaching this milestone on my website. I’m now flat out writing every night, preparing a new version of the manuscript. There are numerous new scenes, a lot of changes to existing scenes, and writing them will progress at an uneven rate (as a general rule, new scenes will take much longer to write than updating an existing scene). However, I’ll keep you informed (and myself on the hook) by reporting progress as I go! 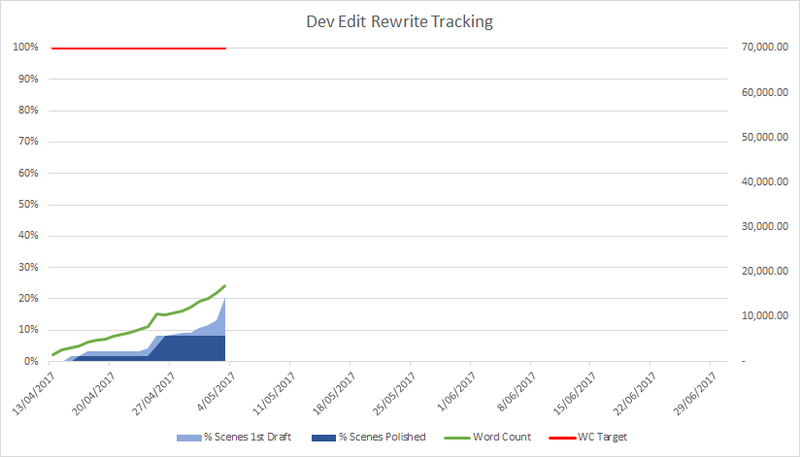 The chart below shows the current status of the rewrite. Work is commencing on the new cover design! Inkshares have an amazing cover designer working on this for me. Right now he’s gathering information before producing concepts to work through. We don’t have a firm production schedule for the book — this stage of the editing process is just too fluid. What I can tell you is it should be sometime (early) in 2018. It is unlikely to be January at this stage, but I hope we’ll get everything in order to get the book out during the first quarter. I’ll keep everyone informed as we progress — the further along the process we get, the more reliable the predicted release date will become. Don’t forget to jump on my Facebook page and hit like. I’m also on Twitter and Instagram.